This article will cover a standard approach to importing project data to Inspire Planner. There are data templates available for download which will help you format your data correctly and easily map it during the import process. Project - captures the attributes of the project. For example, project name, description, etc. Project Task - captures all parent and child tasks related to the project. This data will include task name, status, start date, finish date, etc. Task (Salesforce) - captures the task assignment. When a Project Task is assigned to a User/Contact via the Assigned To column, a Salesforce Task is created to represent the task assignment. You will need to know the Salesforce IDs of related Users and Contacts to import this data. First you will need to download the 3 template files that are available in this article. Each template contains all relevant fields for each object. You will also see an example record in each template. This will provide you guidance to how the data needs to be formatted for each column. Format your Project data as per the Project Data Template provided. Once your data file is complete, you will need to save your file in .csv format in order to import it. It is important to include a unique identifier for your projects. This is captured under the External_ID__c column and will be used to link related Project Tasks to the Project. This ID will also be used in the Project Task Data Template. Format your Project Task data as per the Project Task Data Template provided. Once your data file is complete, you will need to save your file in .csv format in order to import it. It is important to include a unique identifier for your project tasks. This is captured under the External_ID__c column and will be used to link related Tasks (Salesforce) to Project Tasks. This ID will also be used in the Task (Salesforce) Data Template. The project External ID should be used in the Project__c column. This is used to link Project Tasks to the related Project. Format your Task (Salesforce) data as per the Task (Salesforce) Data Template. Once your data file is complete, you will need to save your file in .csv format in order to import it. 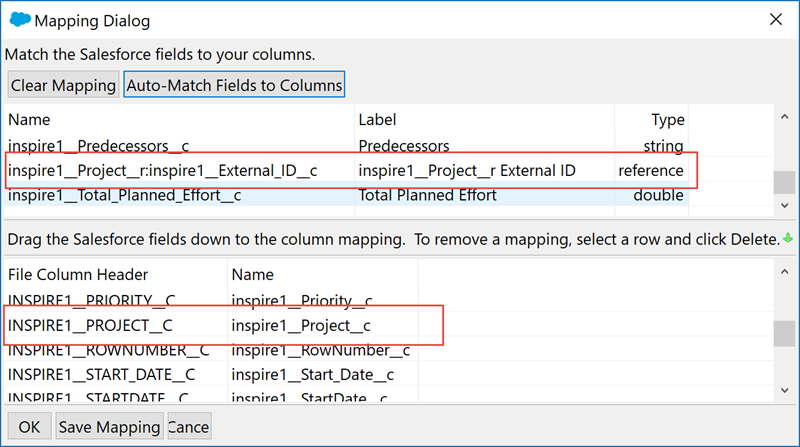 The project task External ID should be used in the Inspire_Task__c column. This is used to link Tasks (Salesforce) to the related Project Task. The first step is to import your Project data. 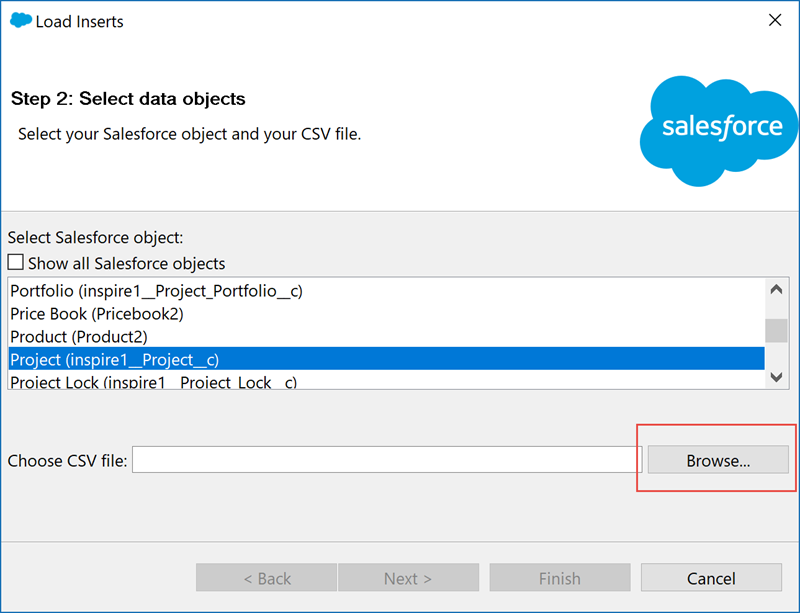 Select 'Select Salesforce object:', select Project (inspire1__Project__c). And then click Browse and select your Project data file. Click 'Next' and then okay to record summary dialogue. Click 'Next' and then 'Finish' button start your Project import. When the import is complete, a failures file will be created for all data import errors. Review and fix your data issues and repeat the process. Once your Project data has been successfully imported, now it is time to import your Project Task data. Since we need to use the External Project ID to match Project Tasks to Projects, we must use the 'Upsert' function instead of 'Insert'. Select Project Task (inspire1__Project_Tasks__c) object from the list. Then click the 'Browse' button to select your Project Task data file file. Then click 'Next' and then 'OK'. Under 'Select the field for matching...', select inspire1__External_ID__c, then 'Next'. After all fields have been mapped, then you need to overwrite the inspire1__Project__c mapping. Replace with inspire1_Project__r:inspire1__External_ID__c. Click 'OK' and then 'Next'. Click 'Finish' to start the import process. Format Projects. 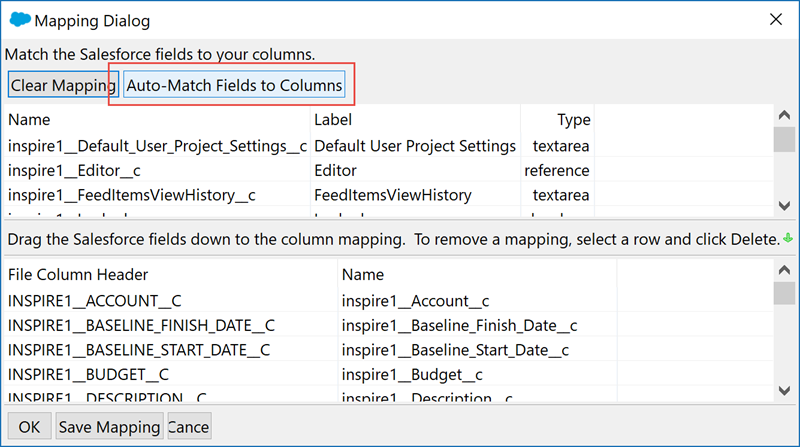 You may need to format your Project Tasks within Inspire Planner. For example, you may need to group your tasks into their parent/child hierarchy. 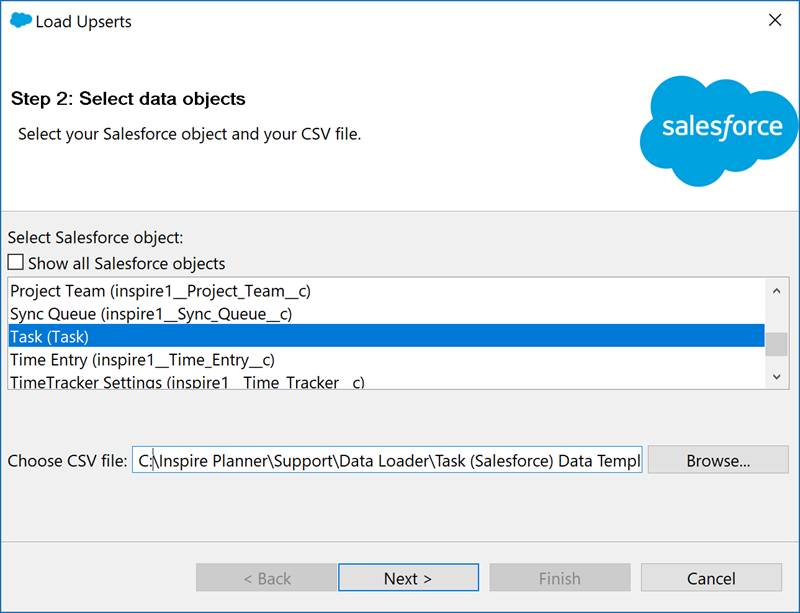 If you would like to import Project Task assignment detail (Assigned To column), then you will need to import Salesforce Tasks. These records will assign Project Tasks to Users in Salesforce. 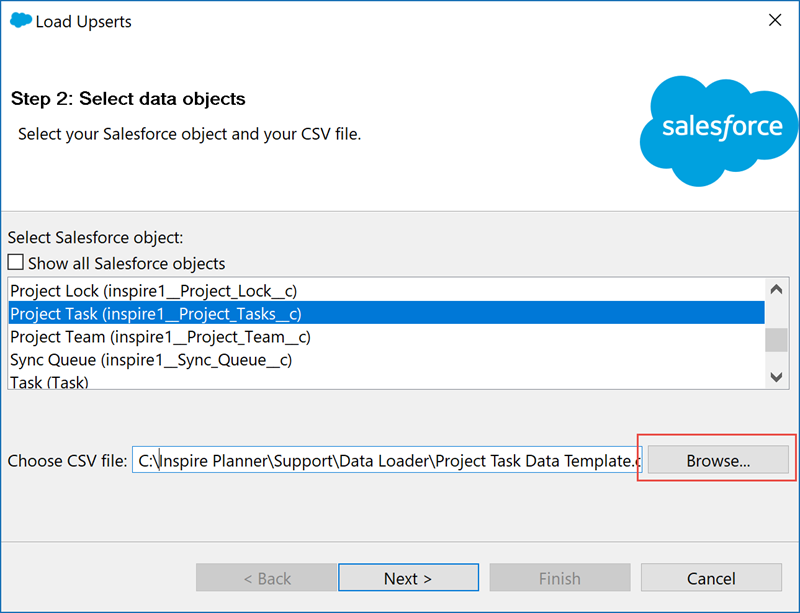 Since we need to use the External Project Task ID to match Salesforce Tasks to Project Tasks, we must use the 'Upsert' function instead of 'Insert'. Select Task (Task) object from the list. Then click the 'Browse' button to select your Project Task data file file. Then click 'Next', 'OK' and then 'Next'. Under Step 2b: Choose your related objects, select inspire1__External_ID__c from the picklist and click 'Next'. 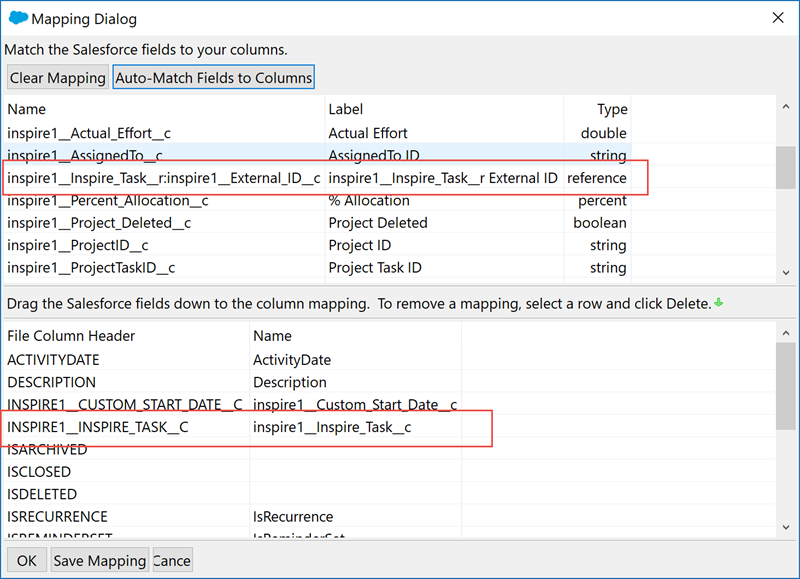 After all fields have been mapped, then you need to overwrite the inspire1__Inspire_Task__c mapping. Replace with inspire1_Inspire_Task__r:inspire1__External_ID__c.